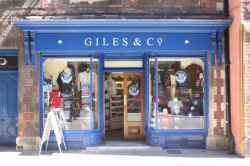 Giles & Co is a card and gift shop selling a range of greetings cards for different occasions, as well as gifts and wrapping paper. Based in Trinity Street, Cambridge, Giles & Co is a cards and gifts shop. Giles & Co is in Trinity Street Cambridge. You can view a list of neighbouring businesses by going to the Trinity Street page. If you would like a list of other listings throughout Cambridge, please visit the Cards and Gifts section of this website. Note: the pin is positioned at the postcode centre, and may not correspond with the precise location of 4 Trinity Street.